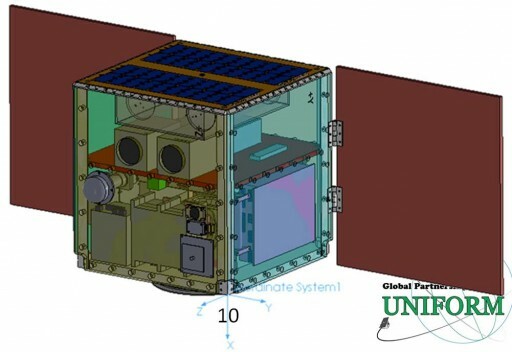 UNIFORM-1 is part of the University International Formation Mission that was established in 2012 with the goal of putting a series of microsatellites in orbit and build an operational ground segment for use by multiple missions to decrease the cost of microsatellite projects run by universities and other institutions in the Asia-Pacific region and to increase the amount of available data – particularly Earth observation data for a variety of scientific purposes. 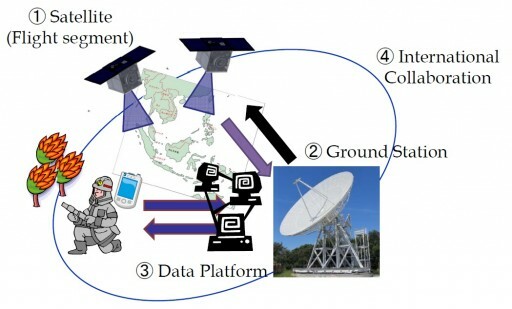 The overall goal of the Uniform program at Wakayama University is the development of a wildfire monitoring system using a constellation of microsatellites to achieve a high-time resolution at a comparable low cost. The Uniform-1 satellite was developed at Wakayama University and is based on a 50 by 50 by 50-centimeter satellite structure with a mass of under 50 Kilograms. The spacecraft carries two primary instruments – a microbolometer array for infrared imaging and a visible imaging payload. 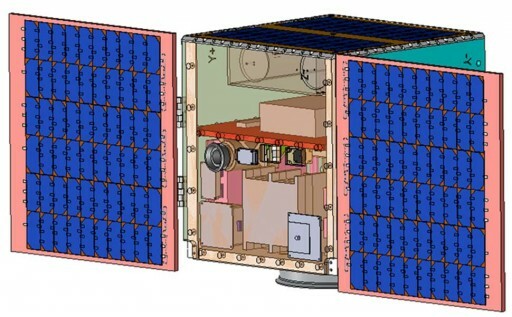 The UNIFORM-1 satellite uses body-mounted solar panels as well as two deployable rigid solar panels to generate more than 100 Watts of electrical power. The solar panels use Gallium-Arsenide solar cells with 20 cells in series in the +x, +y, -y, +z panels, 20 cells in series with two in parallel on the -x side and 20 series x 7 parallel on the -z panel using the two deployable solar panels. The various satellite systems consume around 50 Watts of power on average. A Lithium-ion battery onboard the satellite is used to power storage offering a capacity of 5.1 amp-hours. The satellite uses a star tracker unit for three-axis attitude determination as well as three sun sensors and a magnetometer. A Fiber Optic Gyro provides three-axis orientation and rate data to the satellite control unit. A reaction wheel assembly featuring four wheels is used for attitude actuation in nominal ops mode while three magnetic torque rods are used for momentum dumps and control in satellite safe mode. 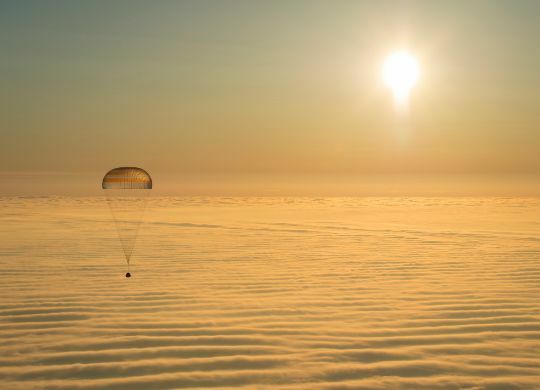 Orbit determination is accomplished through the use of a dual-channel GPS receiver. Data handling and commanding of the satellite is completed by a small size Onboard Computer that features a redundant design and connects to an RS-422 data bus that is used to exchange data between the various satellite systems including the payloads. UNIFORM-1 uses S-Band and X-Band communications terminals for data downlink and command uplink. Two S-Band antennas build a redundant system operating at 64kbps for data downlink and 10kbps for the uplink of commands. The bulk of payload data is downlinked via a high-speed X-Band transmitter that achieves data rates of up to 10Mbps. The spacecraft is equipped with Hydrogen Peroxide Thrusters for orbit control and maintenance achieving a specific impulse of over 80 seconds. The main payload of the satellite consists of a Microbolometer Array that is used for imaging in the thermal infrared spectral band between 10 and 12 micrometers. Each pixel on the array consists of several layers including an infrared absorbing material and a reflector underneath it that directs IR radiation that passes through the absorber back to the absorbing layer to ensure a near complete absorption. As IR radiation strikes the detector, the absorbing material is heated and changes its electrical resistance which can be measured via electrodes connected to each microbolometer and processed into an intensity read-out. The Microbolometer Array achieves a ground resolution of 100 meters over a swath width of 100 Kilometers. In addition to locating wildfires with the IR imager, UNIFORM-1 will acquire high resolution optical images of targets to provide imagery to better locate and asses wildfires and help in response efforts.